Merry Pet Cat Washroom Bench helps to conceal the cat litter box, keeping the litter spillage inside and reducing litter tracking and odors. 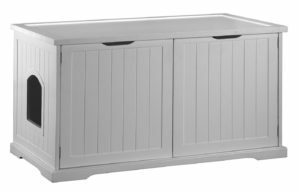 The unit is a nice piece of furniture that features a removable divider on the inside that creates a storage compartment to place the cat litter or other items. On the outside, this cat washroom bench offers several options, for example, you can add nice cushion and pillows to make it a rest area for your cat. This cabinet looks great in any space of your house, living room, laundry room or bathroom, etc. 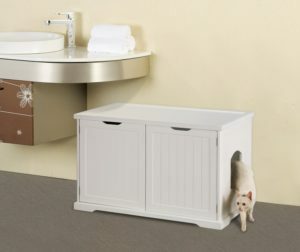 Merry Pet Cat Washroom bench offers a nice space so you can place a large litter box and even an automatic litter box due to its pre-cut hole in the back panel for access to the outlet. The Cat washroom bench features two front doors so to scoop the litter box just open the front door for easy access. Features wainscoting details on panels and natural wood grains. Accommodates any litter box size, and some automatic devices. A pre-cut hole on the back panel for access to an outlet for automatic litter boxes. The cat washroom bench comes with 8 panels to assemble: back, left, right, top, bottom, left door, right door, and optional divider. The unit also includes the hardware (screws, dowels, etc) and one spare of each piece in case you lose one. Make sure to have a large Phillips screwdriver and a small Phillips screwdriver for assembly. The instructions to assemble are easy to follow and it takes 30-45 minutes to assemble the unit, depending if you do it alone or someone helps you. The bench features only one entry opening so before assembling the unit you need to decide on what side you will place the panel with the entry, on the right or the left. 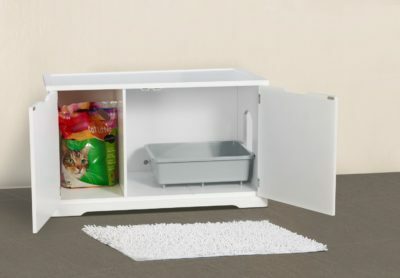 When assembling the cat washroom you have the option to add the divider or not and instead, leave the entire area for the litter box. The divider is meant to create two spaces inside the bench and it slides between the bottom and top panels. With the divider inside, the dimension of one compartment is 23 inches and the other compartment, 11 inches. The inside dimensions of the bench are 20″ x 35″ x 19″ tall, so the unit is roomy. The cat washroom bench sits up off the floor by about ½-inch and it features 4 rubber feet on the bottom. Merry Pet Cat Washroom bench is not made of solid wood, is made from medium density fiberboard, though the panels are sturdy with a decent weight. The walnut color features natural wood grains. In some units, the pre-drilled holes are not well aligned with the doors. It is not made from natural solid wood (pressed wood panels). In some units, the pre-drilled holes are missing. The cam locks don’t completely lock in some areas, making the bench`s construction a little wobbly. Over time the hinges may become loose from the doors with the constant opening so you must be very gentle when doing it. √ If you want the least of litter on your floor, you may want to pass on the divider and leave the entire area for the litter box and next to it place a mat. Outside the cat washroom bench, place another litter mat as well. √ If your cat misses the spot when urinating you must line the interior with plastic or another material. Another solution is giving the bench several coats of polyurethane. √ When assembling the front doors, it`s hard to line up the hinge holes with the screw holes. A solution is upholding the door in the installed position using some of the Styrofoam packing material so you can align the hinge holes with the screw holes and then screw the small screws. √ Make the unit mobile by purchasing a 4-pack of 1 5/8 inch swivel bearing castors at your local hardware store (the ones with pins). To do this you need to remove the rubber feet that come with the bench, they are easy to remove since they are only nailed. Merry Pet Cat Washroom Bench looks nice and basically does the job of concealing nicely the litter box. Take into consideration that this unit is not made from solid wood, however, the panels are sturdy and on the heavy side. The quality of the hardware and the pre-drilled holes are poor in some cases, but it can be solved making some personal adjustments, however, do not expect a solidly constructed piece of furniture that you can move around the house often. The unit serves its purpose, but once assembled, it is meant to stay ideally in one place. All in all, you won’t find a litter box enclosure this size for this price if you are expecting solid natural wood. In general terms, the quality of this item is not excellent, but it`s decent and looks nice. The Company does not offer a phone number to contact customer service but you can contact them via email.